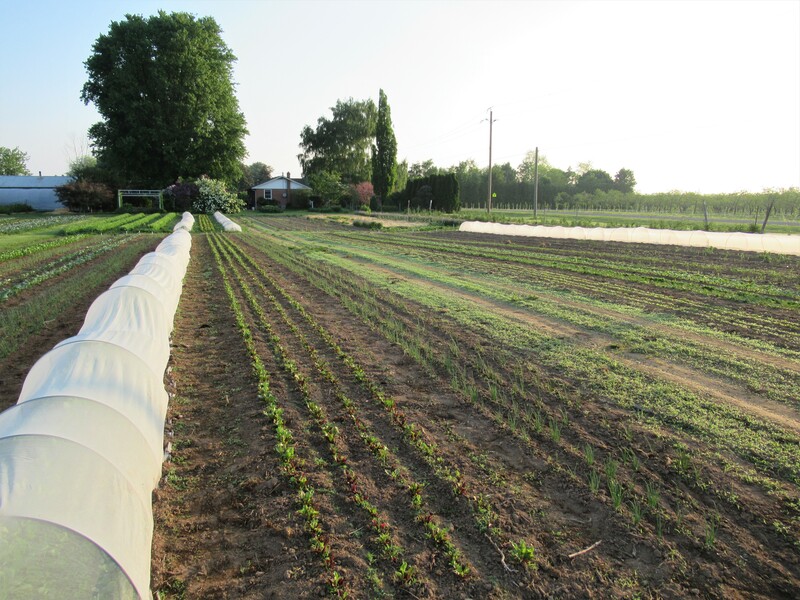 Many of the vegetables we grow on our farm are transplanted. That means they are seeded into containers, usually in the greenhouse and when they reach a certain size we transplant or replant them out into the field. There are several reasons for doing it this way. Starting seeds in the greenhouse means we get better germination & growth because we can somewhat control the temperature & water that the seeds receive. Giving the seedlings their ideal conditions means stronger, healthier plants. We can also start earlier in spring. And transplanted seedlings can better compete & hopefully outgrow weeds. The challenge is that when the seedlings are ready, we have to get them planted out quickly. If they have to wait – due to bad weather or field conditions or until we have time – they can outgrow their pots, lose their vigor & then have difficulty getting established & growing well in the ground. Sometimes they never recover. And transplanting is a lot of work! It’s hard on the back! This is a new piece of equipment we purchased this season – and we LOVE IT!! 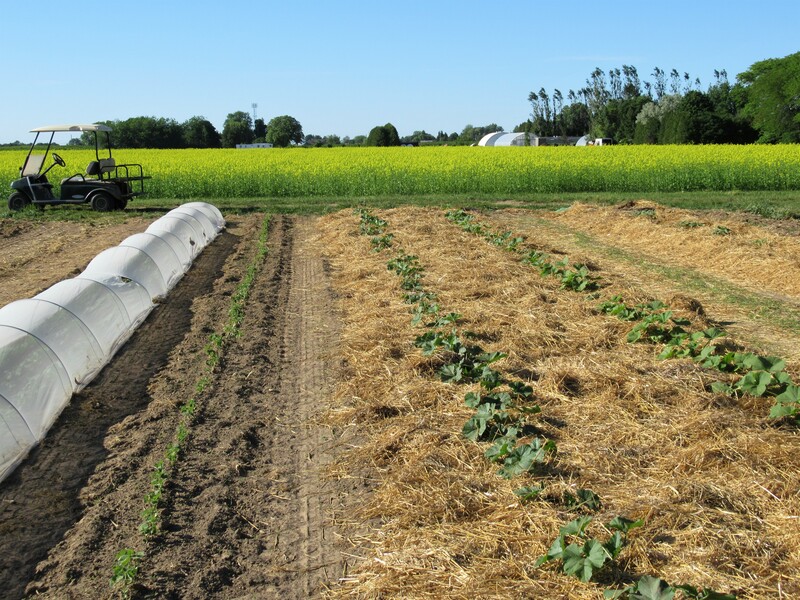 Developed in Japan for the sugar beet industry, it came to Canada a few years ago. I’ve had my eye on it ever since & now we have one. It saves an incredible amount of time & effort. Seeds are grown in special paperpots that look like a honeycomb. 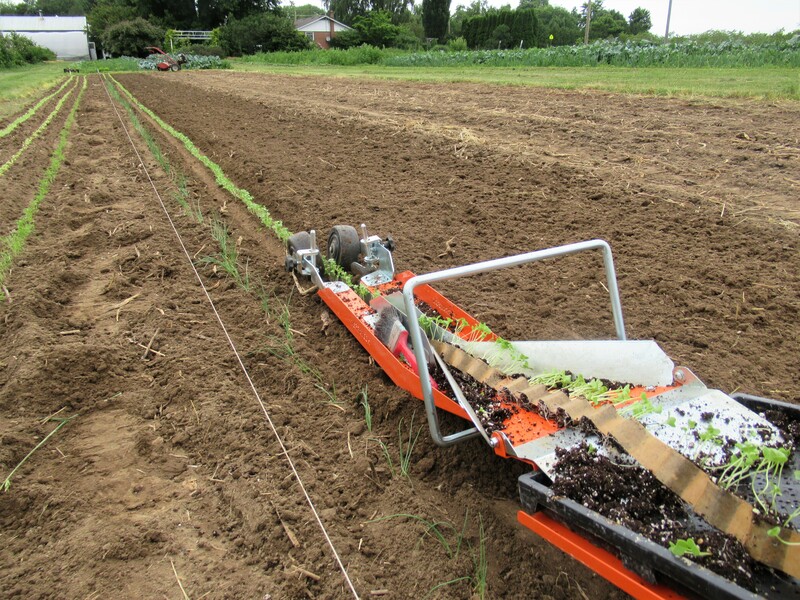 Then this rather simple yet ingenious machine that we pull by hand (no noisy motor required!) 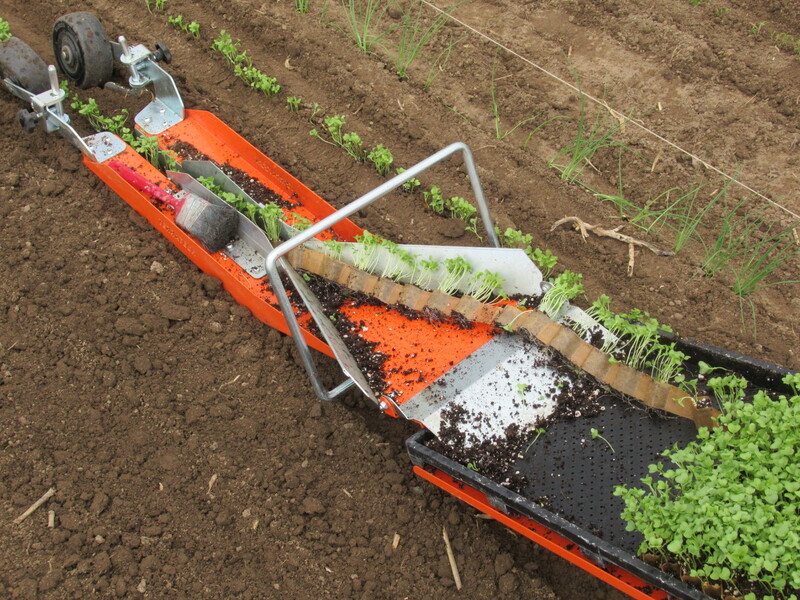 makes a furrow, unwinds the paperpots, plants them, mounds soil around the seedlings and firms it down. You have to see it to believe it. Pictures are not enough. (check out a short video on our instagram account – instagram.com/thiessenfarms). What used to take us several hours of hard work can now be done in several minutes. It’s that fast! 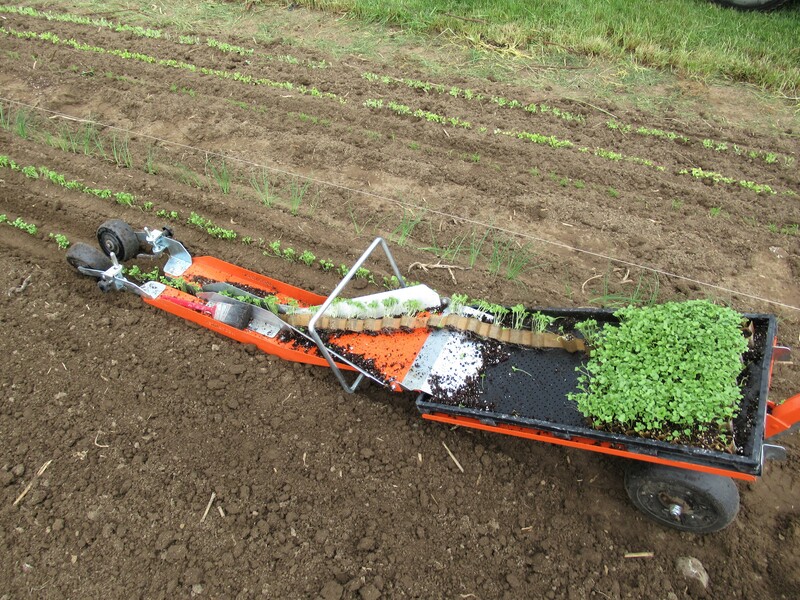 We can use the paperpot transplanter for onions, spinach, lettuce, broccoli, bok choy, arugula & other herbs & greens … Bigger vegetables that must be spaced further apart like tomatoes, peppers, zucchini … are still transplanted by hand. It’s been fun learning how to use it and trying all sorts of different vegetables to discover what works & what doesn’t. And our backs are thanking us! Broccoli, garlic scapes, kohlrabi, kale, lettuce, green onions, radishes, snow peas. 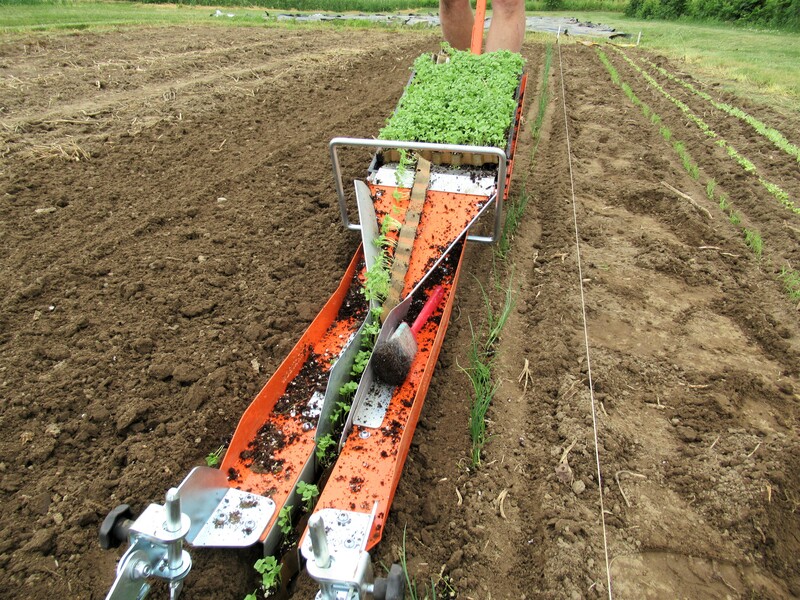 The broccoli plants got in the ground early this year, and then grew well – and grew & grew. But the heads sure were slow to appear. Now finally, we have broccoli and it tastes great! Garlic scapes are a favourite for many. They are the top of the garlic plant. We cut them off so the garlic puts all its energy into forming a nice big bulb underground. Leaving the scapes to grow would produce flowers & seeds instead, which we don’t need or want. Use them wherever garlic bulbs are used – raw or cooked. Their flavour is a bit milder. They are also great on the BBQ. Coat the whole garlic scape with olive oil, and sprinkle with salt & pepper. Grill for a few minutes on each side until well charred & tender. As usual we have included our recipe for garlic scape pesto below. 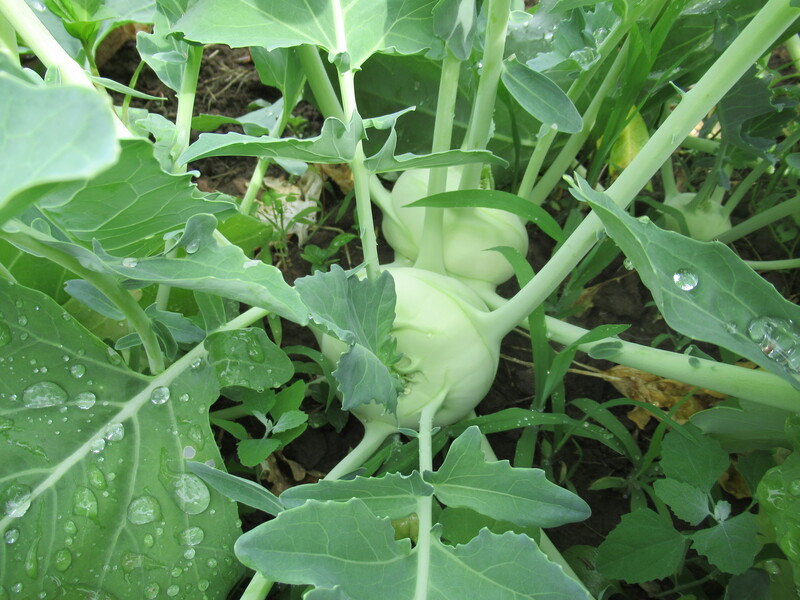 It seems that kohlrabi was something new for many of our CSA members. Did you like it? You will find another kohlrabi in your share this week. In addition to the serving suggestions we gave in last week’s newsletter, try it on the BBQ. We slice it about 1/4″ thick, brush with olive oil & grill it until it starts to be tender. Delicious! We have also included the link to a recipe for kohlrabi fritters which is always popular. http://honestcooking.com/kohlrabi-fritters-vermont-csa/. We have included a bunch of kale in your box, either plain or curly. We enjoy kale raw in our salads, but it is good cooked too. Kale tastes great with olive oil and garlic, onions or leeks. Combine it with sweet vegetables like corn or carrots. Unless the kale leaves are very small & tender, remove the tougher stems before using. Store kale in a plastic bag in the refrigerator crisper for 3-4 days. But be aware – the longer it is stored, the stronger the flavour becomes. Lettuce, green onions, radishes & snow peas all prefer cool temperatures over warm. We have had both this past week. 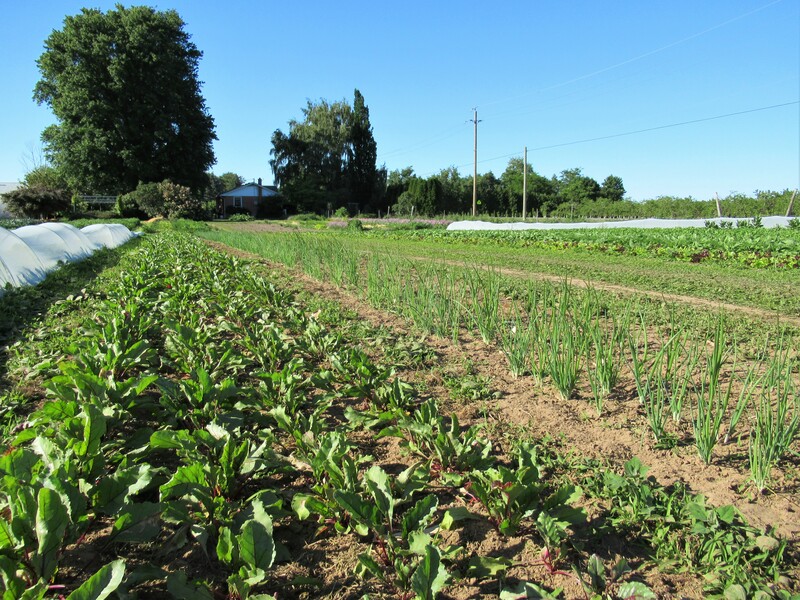 The lettuce & green onions continue in good shape but the radishes are going to seed quickly. This means that while the radishes still taste good, the green tops might not look as good. This 2nd planting of snow peas is winding down quickly. 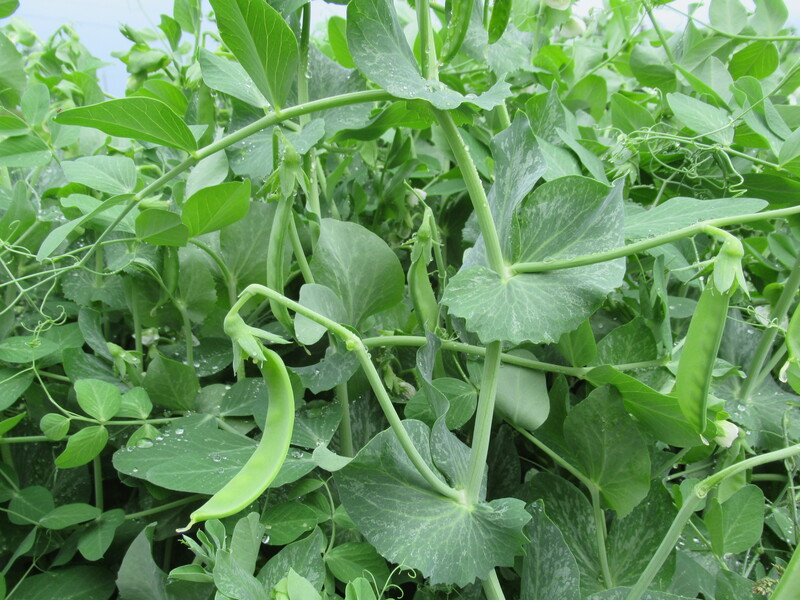 There will be snow peas this week – but not a lot. There is still 1 more planting that is 2 or 3 weeks away from picking right now. Something to look forward to! Thank you for all the comments & feedback on the CSA boxes so far. We appreciate hearing your response and suggestions. 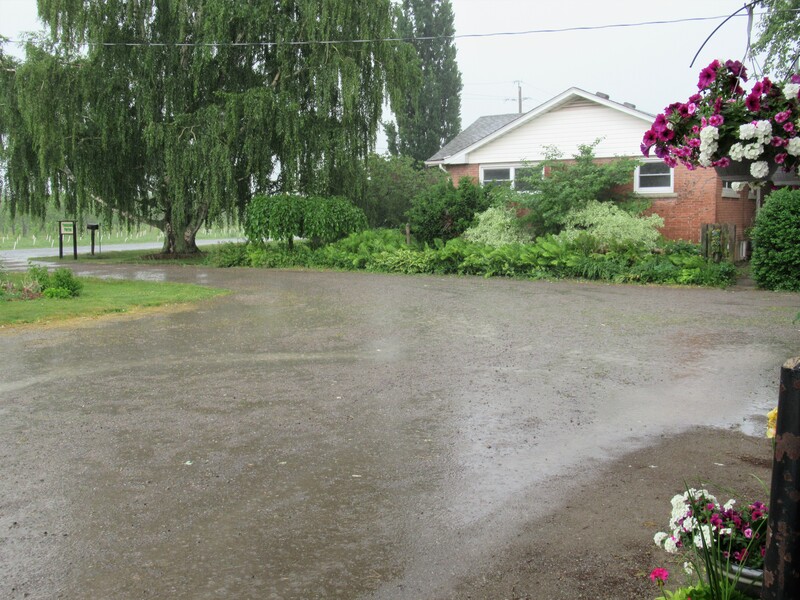 There were puddles on the driveway today – and on the farm – something we have not seen in quite a while. About 2 1/2 cm (1 inch) of rain fell this afternoon – rain that was very welcome and very much-needed. The farm had been getting quite dry. Seeds we had sown were germinating slowly & poorly. Vegetables we had transplanted to the fields were suffering and shriveling, despite being watered. Today’s rain will go a long way towards reviving, refreshing & renewing the crops. We are thankful! Before the rain, the day started out hot – very hot! And humid too. And windy – hot winds, not refreshing winds! Actually, the last few Mondays have been similar. On the Monday we transplanted zucchini, tomatillos & bitter melons, the winds blew & the tender seedlings cowered & wilted in the hot, dry soil. We watered & watered. 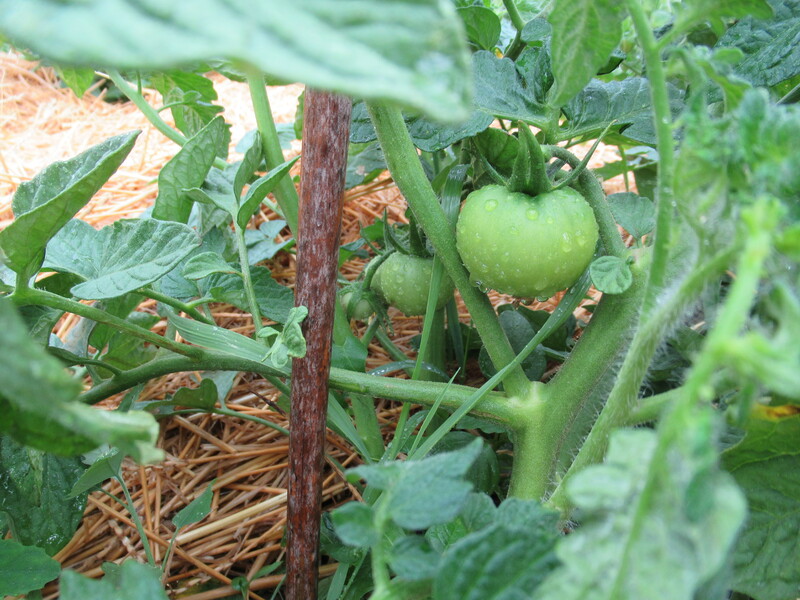 A lot didn’t make it (especially the tomatillos) but those that did are looking healthy & growing – finally! It’s been a rough season for our peppers right from the start. Cold weather back in March when we seeded them in the greenhouse hindered germination. Continuing cold temperatures meant poor growth & higher than usual mortality. Then last Monday we transplanted the survivors into the field. Again the withering winds blew & the poor peppers struggled yet again. 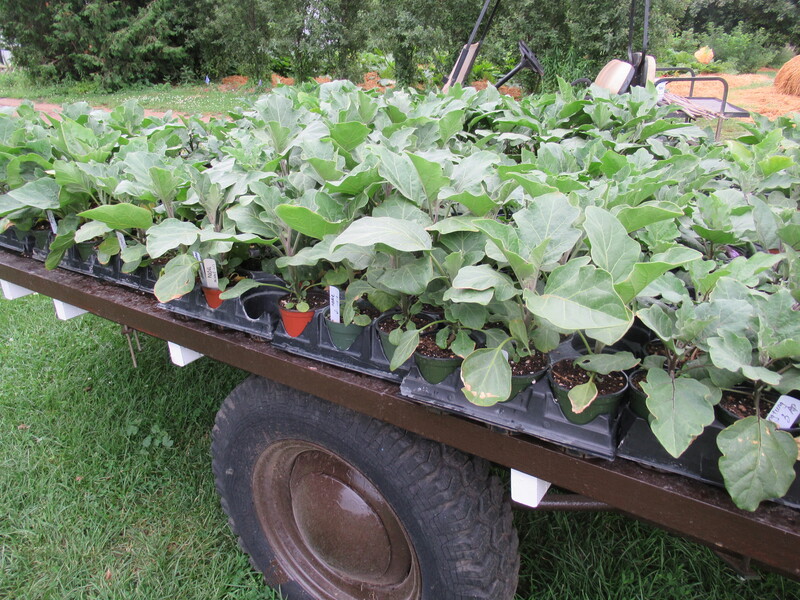 Today we had a trailer full of eggplant to put out in the field, eggplant that are long overdue to be planted! But with a forecast calling for extreme heat, humidity & winds – we decided to wait. … and starting to sucker & tie the tomato plants. The plants have many little tomatoes already! Snow peas, kohlrabi, radishes, salad turnips, lettuce, spinach, green onions. Last Tuesday there were not quite enough snow peas for CSA. By Friday there were plenty. 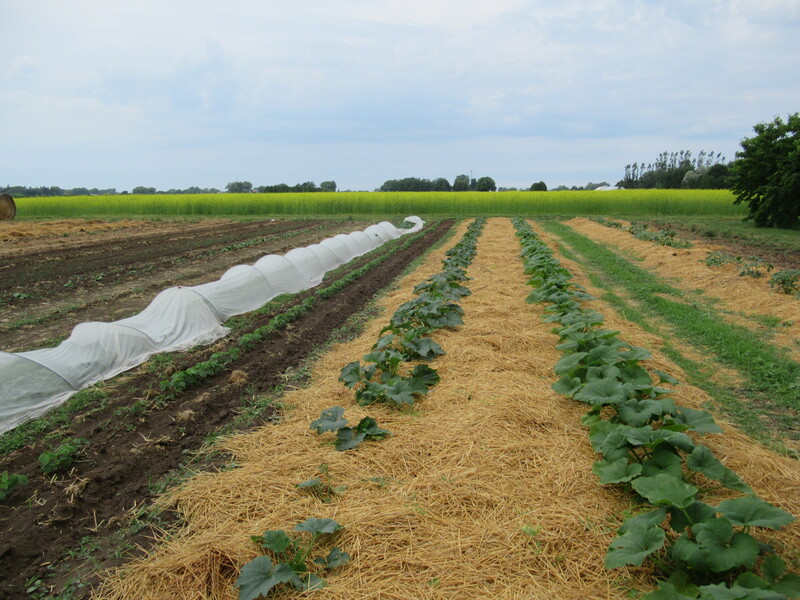 This week we are picking both the 1st and the 2nd planting – which means the season will go quickly. But enjoy the snow peas in your box this week, whether you prefer them raw as a snack or quickly blanched or stir-fried. They are delicious any way! Kohlrabi is a strange-looking vegetable – sort of like a cross between a little cabbage and a turnip. It is usually considered a root vegetable, though the edible round globe grows above ground. Kohlrabi is usually eaten raw – just peeled & sliced. The taste & texture resembles fresh, crunchy broccoli stems, with a bit of radish thrown in. Use on raw vegetable platters and serve with a creamy dip. Grated kohlrabi can be added to slaws. Kohlrabi can also be steamed or boiled but don’t peel until after they are cooked. When the bulbs are tender, peel skin, and season with butter, salt, and pepper, a cheese sauce, or just enjoy plain. They are good for mashing with other vegetables – parsnips, carrots or potatoes. Kohlrabi absorbs the flavour of other ingredients making it ideal to add to soup, stew and stir-fries. If the leaves attached to the kohlrabi bulb are fresh and green, they can be enjoyed as a cooked green. Wash the leaves and remove the ribs. Blanch in boiling water until just wilted, 3 to 5 minutes. Drain and squeeze excess water from leaves. Chop leaves, then sauté in a little olive oil or butter. Season with salt and pepper. Add a splash of vinegar or squeeze of fresh lemon juice. The bulbs should be stored, unwashed, in a plastic bag in the fridge. They will hold for a week. Our favourite way to eat kohlrabi (other than raw in slices) is to sautée it in butter & garlic for just a few minutes. Then add just a dash of nutmeg. Delicious! The next plantings of radishes are ready. There are several kinds – it will be a surprise what ends up in your share this week. The hotter temperatures have probably increased the heat of the radishes too! Salad turnips, lettuce, spinach & green onions – all the makings for a fresh & delicious salad. The hot weather has pushed the spinach along & much of it is now going to seed. There should be enough for Tuesday’s box – probably none for Friday! 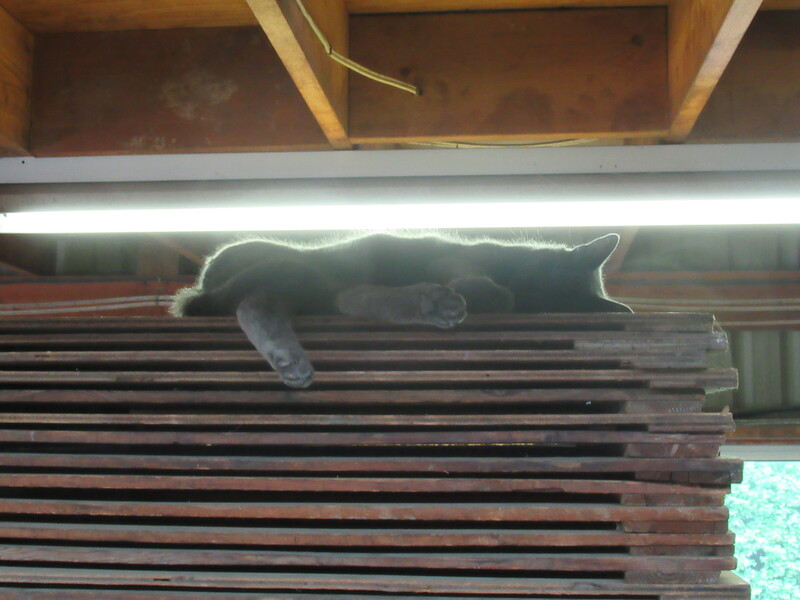 Enjoying a nap in the barn during the rain. 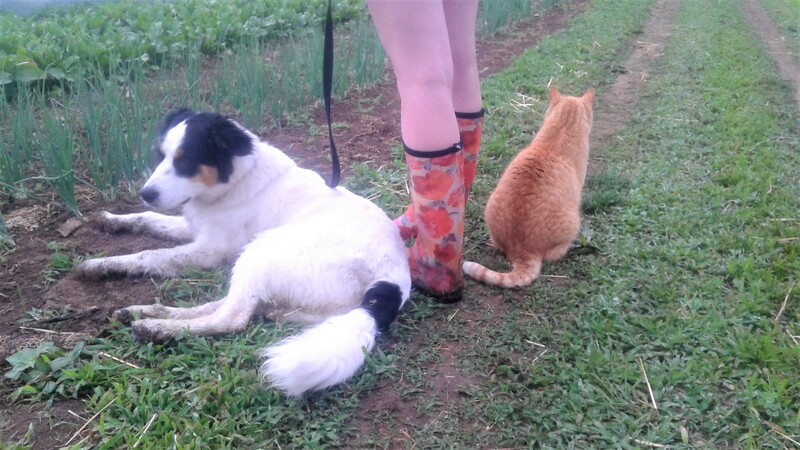 Enjoying a walk (and a rest) after the rain! The view from our farm is pretty spectacular these days! 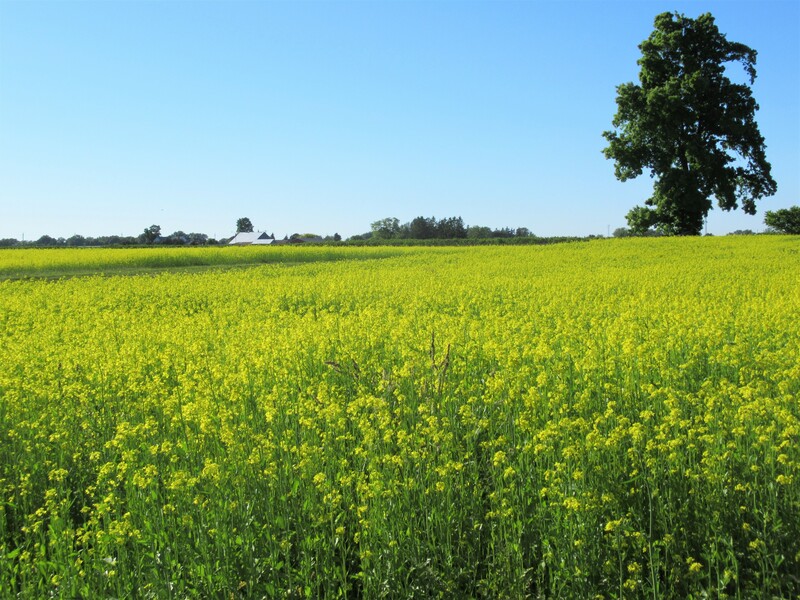 Our neighbours seeded a cover crop of mustard earlier this spring, and now it is in full bloom. 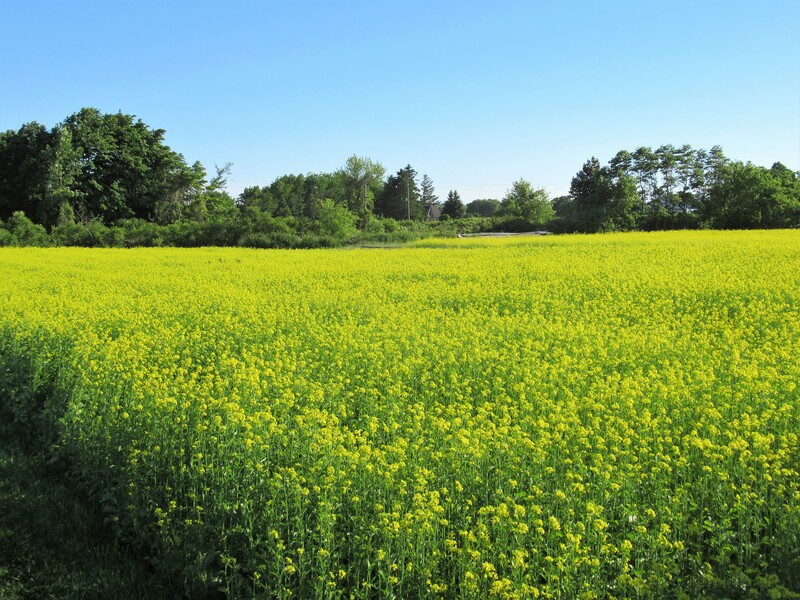 Mustard is an excellent cover crop. 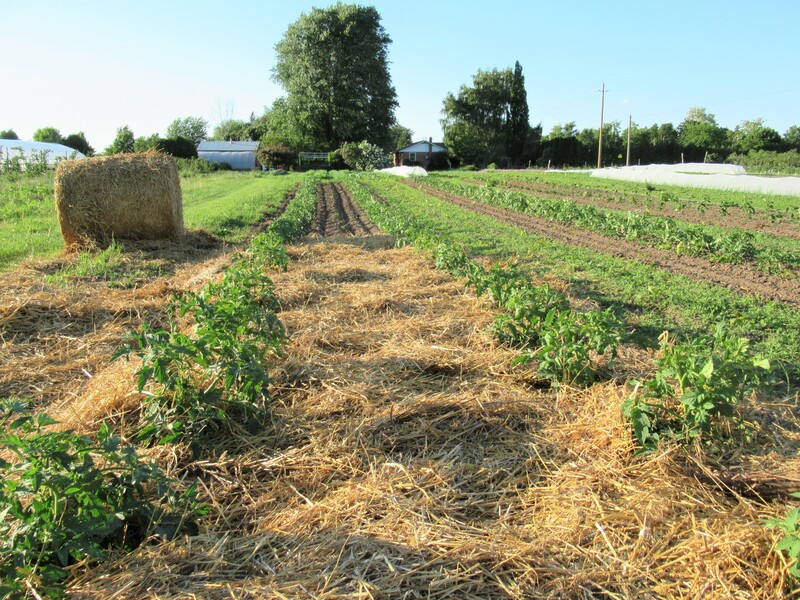 It will suppress weeds, provide habitat for bees & insects when in bloom, and when it is mowed down it will provide organic matter for the soil. 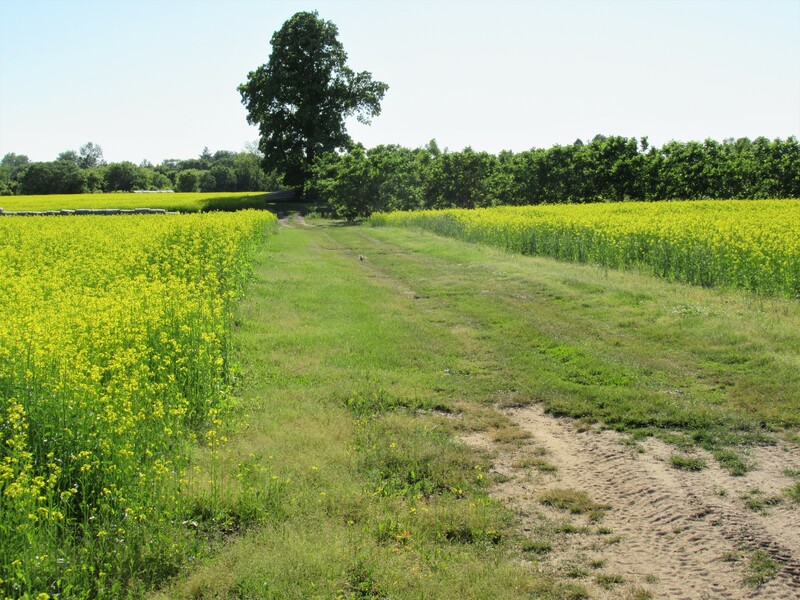 But probably one of mustard’s most interesting & potentially beneficial properties is that it works as a biofumigant. This means that when it is worked into the soil it releases compounds that are harmful to bacteria, fungi, insects, nematodes, and weeds. 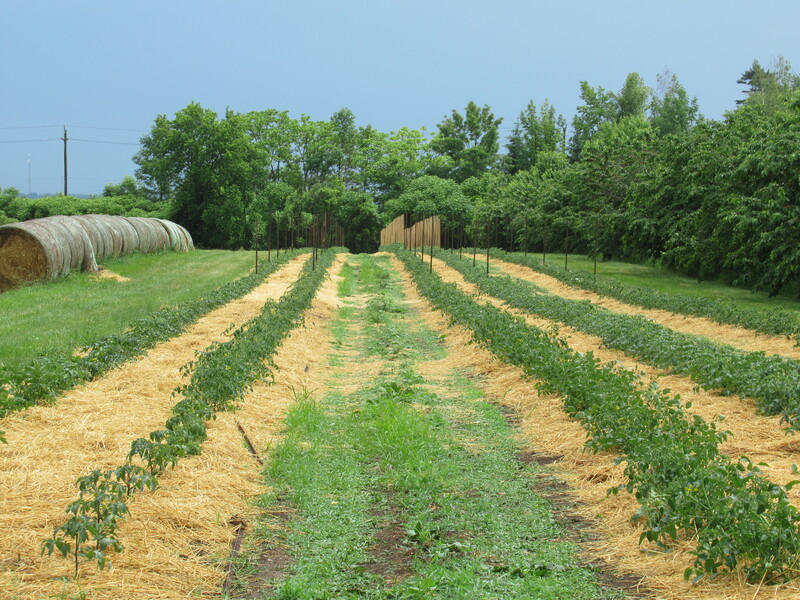 All of this will benefit the strawberries that will be planted in these fields this fall. But right now we are surrounded by all this beauty! We also seed cover crops on our farm. 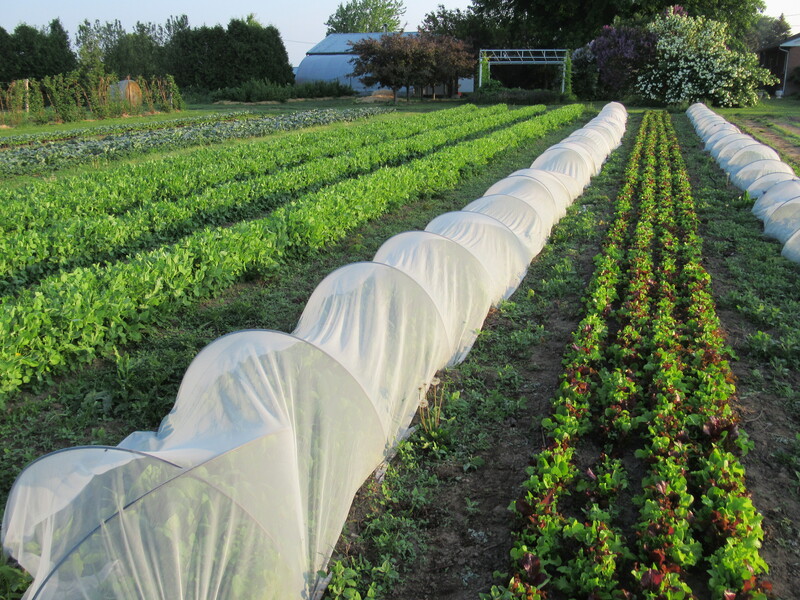 Different crops & mixtures of crops are used depending on what we hope to achieve. 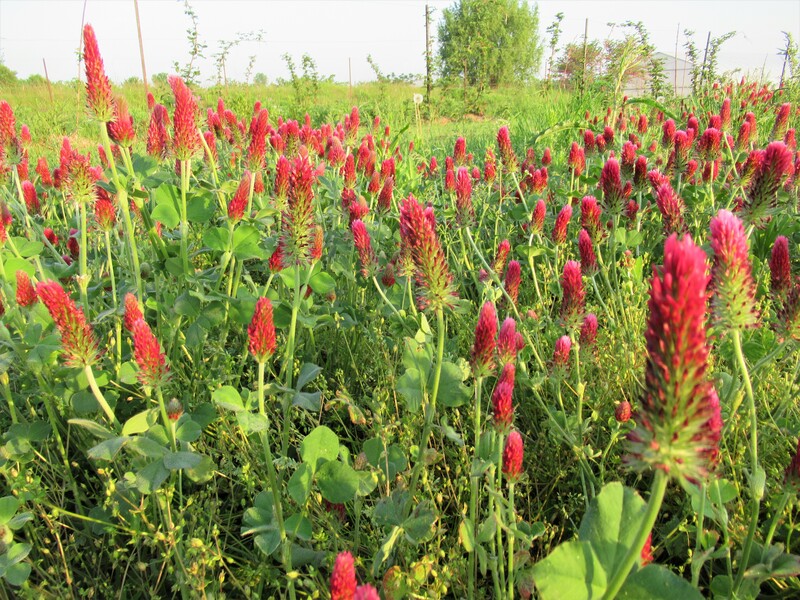 This is crimson clover which we had blooming last month. Clover provides a habitat for bees & other insects, fixes nitrogen in the soil (thus reducing the need for fertilizer), and it adds organic matter. These purple blooms are hairy vetch that we had growing along with rye & other crops over the winter. Not all of it winter killed and now some is blooming beside the garlic patch. 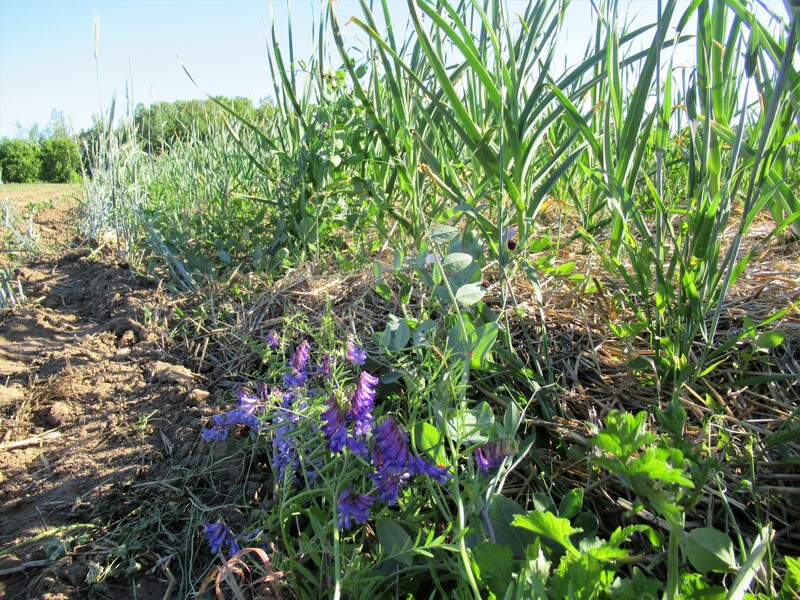 Vetch also fixes nitrogen in the soil, improves tilth & provides some weed control. Areas of our farm that we will not be planting to vegetables until later this summer have been seeded to cover crops as well. The main reason to plant them now is to help keep the weeds from taking over. 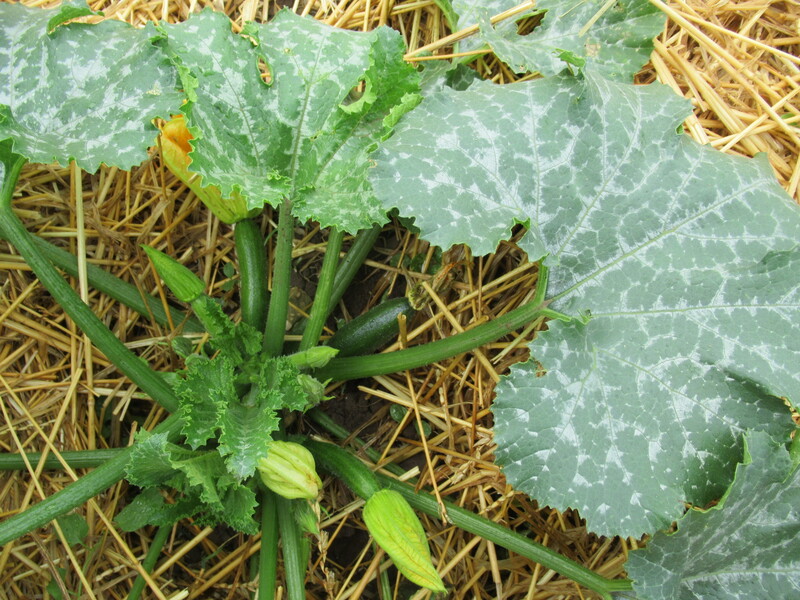 Speaking of weeds … we have had some success in reclaiming vegetables from the weeds. Remember the pictures we posted last week? Things are looking better again. 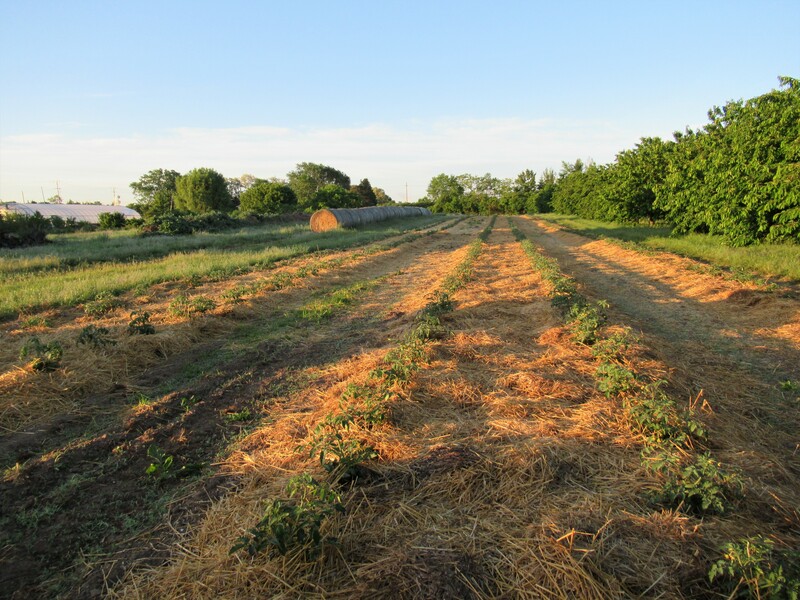 As well, all the tomatoes have been mulched with straw, and the zucchini, tomatilloes & bitter melons. At least we won’t have to deal with weeds in these crops! Salad turnips, kale, green onions, lettuce or lettuce mix, spinach. Salad turnips are small, round, white turnips that resemble radishes, but without the bite – usually! Mild in flavour, crisp, and quite tender, they are best eaten raw – simply wash, cut off the tops and enjoy! They can also be stir fried, sautéed, or steamed – both the turnips & the green tops. I usually consider kale to be a fall vegetable – but it grows well in spring too! It also can be eaten raw, in a salad, or cooked – steamed, sautéed, stir-fried. We have 2 kinds of kale now – the curly kale, and black kale also called dinosaur kale. They look different but taste similar. Green onions, lettuce & spinach will be included in your box again this week. The green onions are growing a bit bigger, but will still be tender & tasty. The lettuce may be the same mix as previous weeks or heads of green or red lettuce. Snow peas were supposed to be the star of the week! We picked them for the first time this morning, anticipating an abundance for the shares this week. 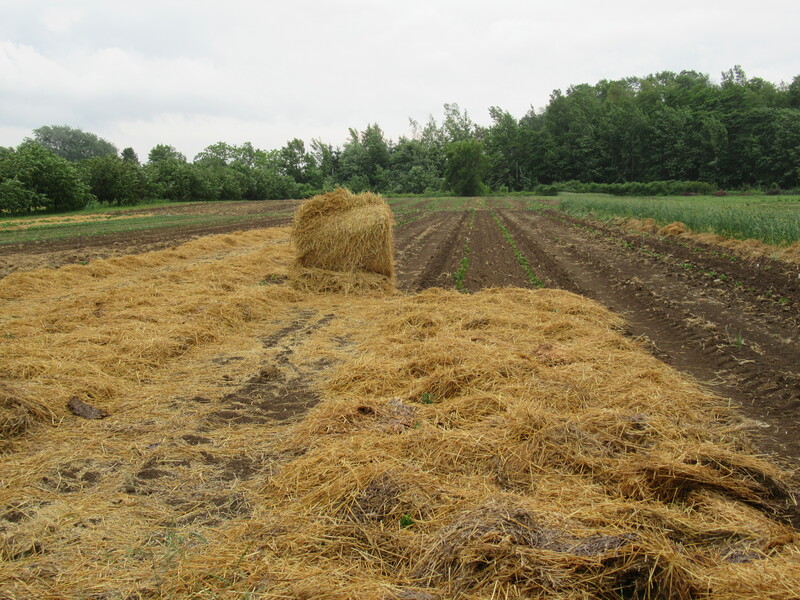 Unfortunately we were rushing them, so no snow peas for Tuesday pick-up – but there should be snow peas by Friday. Here’s hoping! 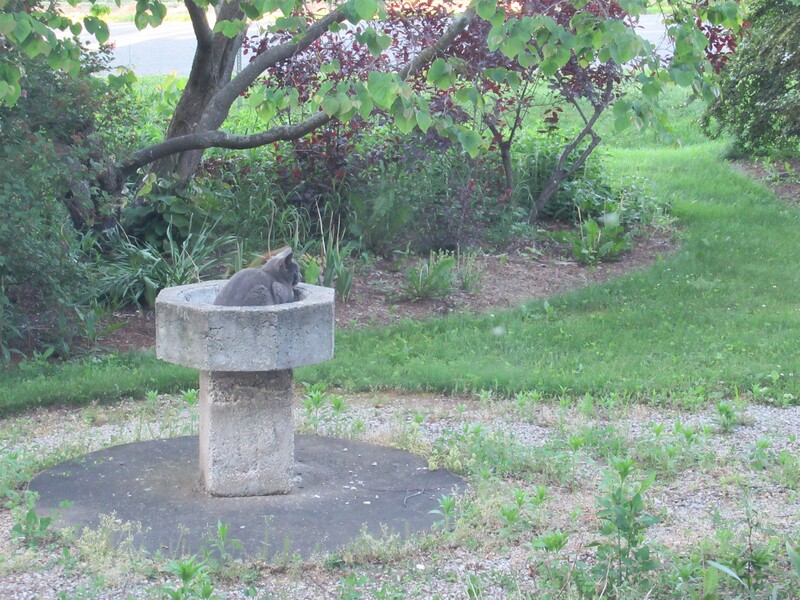 There’s been no rain to fill the bird bath – but it still gets used! And another view of the yellow mustard fields. 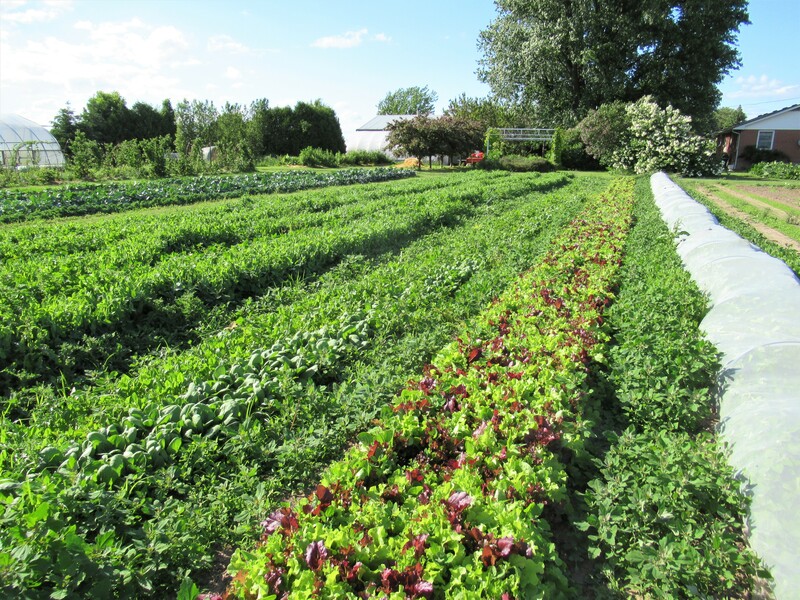 Last week Thiessen Farms had fields of clean, neat and (relatively) weed-free vegetables. This week … it’s weeds, weeds, weeds! Here are 2 examples of last week vs today. And this is despite time & effort spent hoeing & weeding. The increase of weeds is not surprising. Last week’s heat & humidity together with the few showers we received encouraged not only the vegetables to grow, but especially the weeds. While weeding is my happy place (it really is), I surely can’t handle this much happiness! 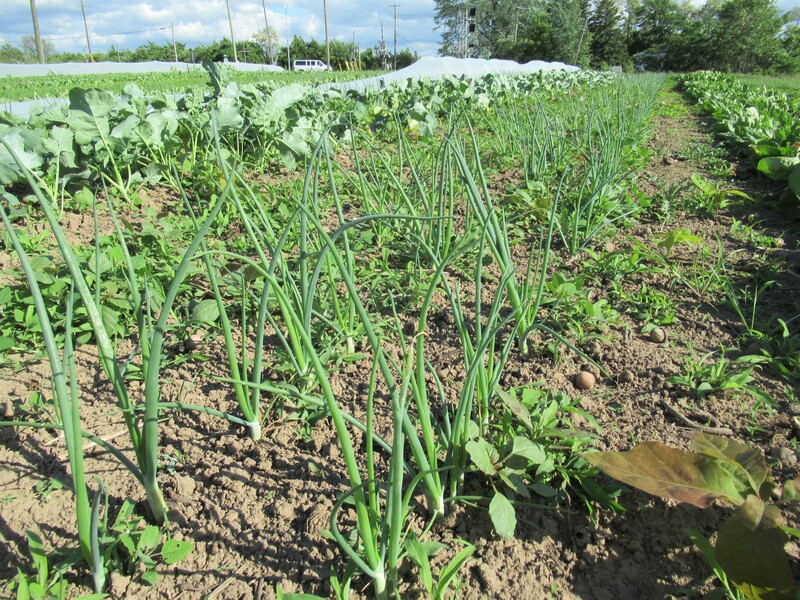 Of all the crops, onions are particularly hampered by weeds. Their shallow root system cannot compete with weeds. Plus, onion leaves are small & narrow and don’t shade out any weeds (like zucchini can for example) which means they get weedy quickly. 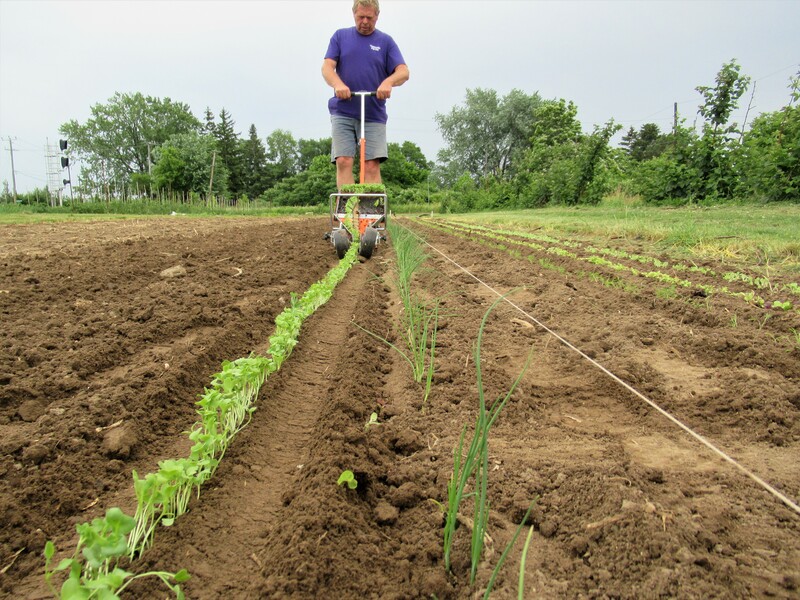 We grow a lot of onions, and try hard to keep them weed-free. Weedy onions = small onions! Other onion patches are a work in progress. 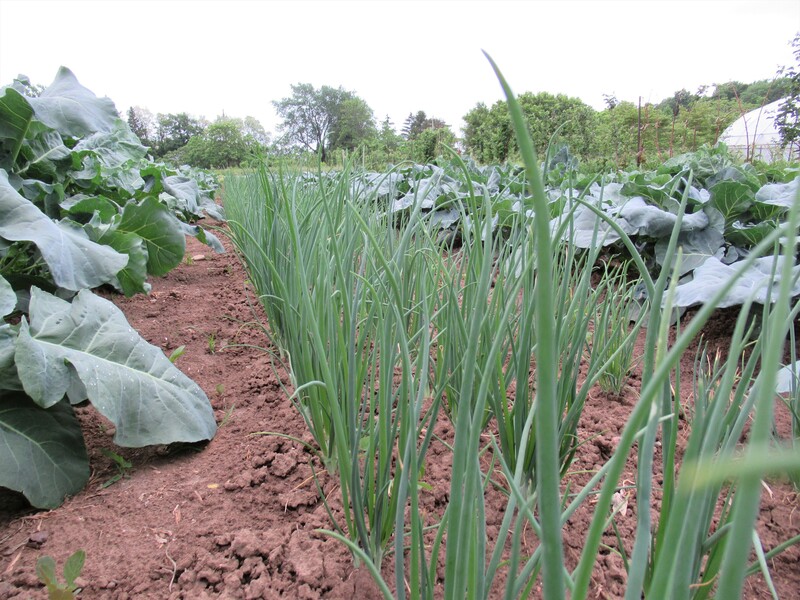 Because onions – especially green onions – are in the ground for only a short period of time, hoeing and hand weeding are the best ways to look after them. 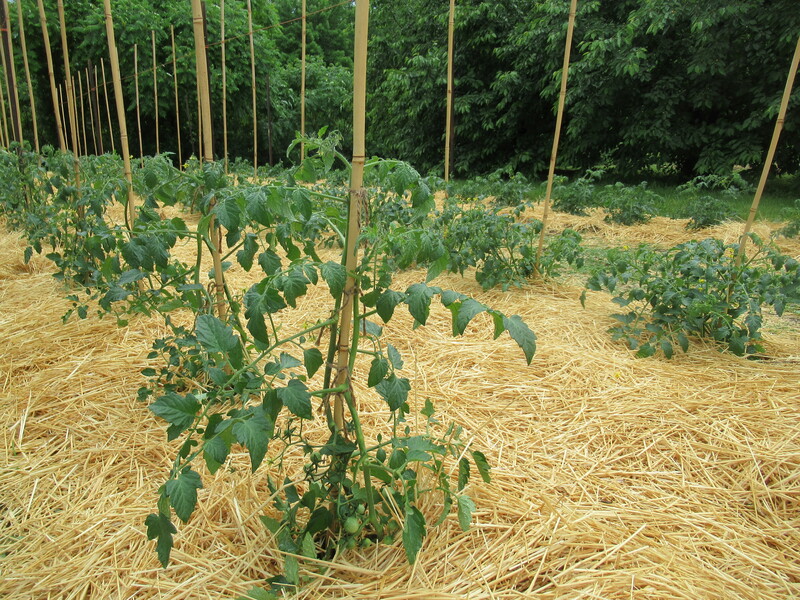 Other crops – like tomatoes or peppers – that are around for the full season and would compete with weeds right through the fall, get mulched with straw rather. 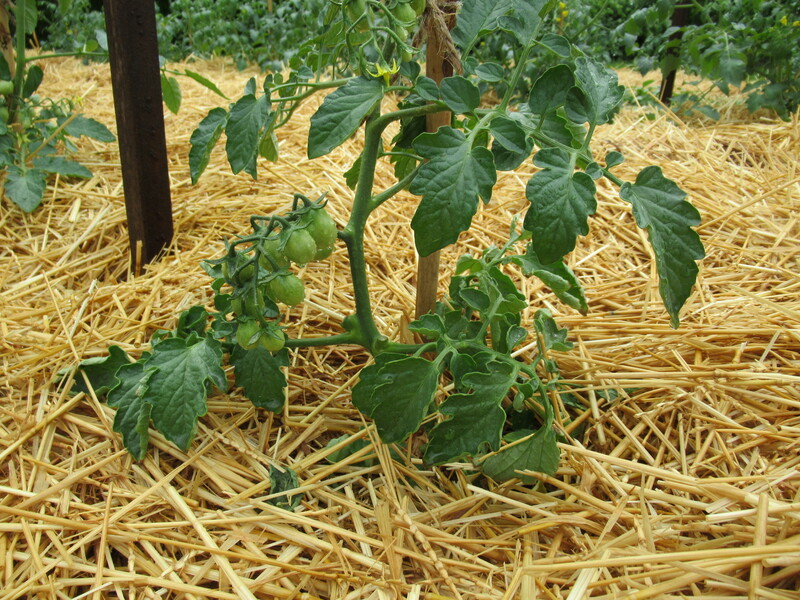 The straw prevents most weeds from growing & eliminates the need for weeding. 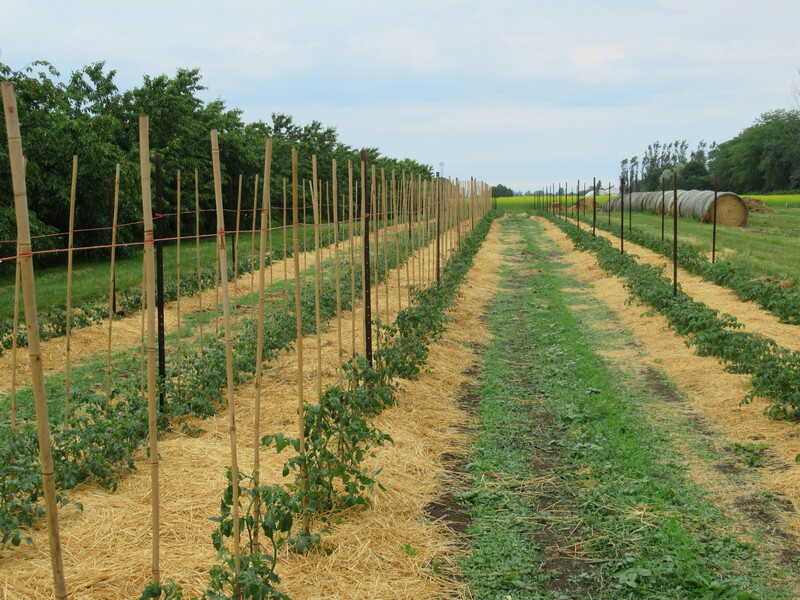 All of our tomatoes are planted in the fields now, and we have started to mulch them. Radishes, green onions, lettuce, spinach, bok choy. 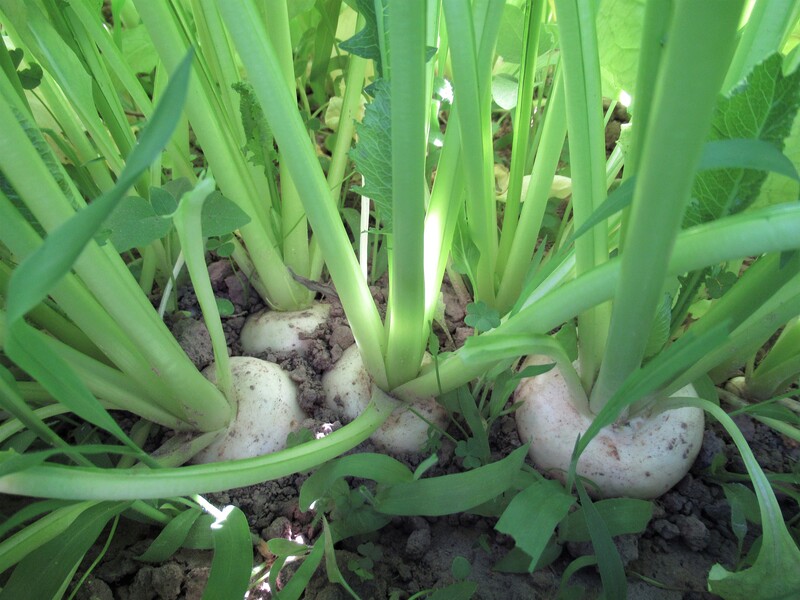 The first radishes are ready – crisp & spicy & zesty! Enjoy them raw as a snack, or add them to your salads. The first onions of the season are green onions, also called bunching onions or scallions. Eat all the onion- the green leaves & the small, bottom white bulb. It’s salad time! enjoy the fresh flavour & texture of lettuce & spinach. Bok choy usually goes to flower when the heat & humidity rise. But I guess last week’s temperatures were not enough to cause them to bolt yet. Use bok choy in your favourite stir-fry recipe – alone or with the green onions & radishes … We have included a bok choy recipe that we tried & enjoyed this week – quick & easy with great flavours! Add the tamari, then the bok choy, turning to coat in the oil and seasoning. Make a slurry of the cornstarch with some water. Push the bok choy to the sides and pour the slurry into the center, stirring to make a sauce. It should thicken and become glossy. Remove the bok choy to a platter, pour the sauce over top and garnish with the sesame seeds. 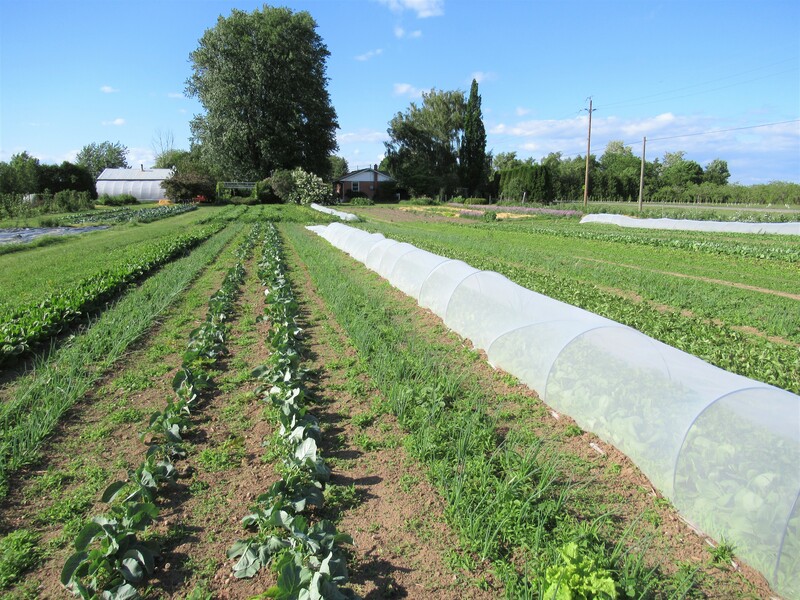 Perhaps next week we can again show pictures of clean, neat and (relatively) weed-free vegetables?